Rachel Von | The Journal Gazette The Komets' Ryan Lowney had a breakout season with five goals and 38 points, tops among Fort Wayne's defensemen during the regular season. It might be easy to overlook Ryan Lowney, the Komets' smallest player at 5-foot-8, 172 pounds, especially since he's a defenseman having to match wits and bodies with big opposing forwards. But Lowney has used positioning to help his defense, smarts to become Fort Wayne's most reliable offensive weapon from the blue line, and he's even been apt to mix it up physically. As the Komets locked up a playoff spot April 5 for the 20th time in the last 22 seasons, Lowney continually pushed feisty 6-foot-5 Indy Fuel forward Radovan Bondra away from goaltender Zach Fucale. Against the rival Toledo Walleye, which Fort Wayne is facing in the Central Division semifinals, his regular-season battles with 6-7 forward Hunter Smith were must-watch hockey and his upending of 6-1 Dylan Sadowy in Game 2 of this series set off a 10-player melee. “This season, they really built their team big and heavy,” Komets coach Gary Graham said of Toledo, which lost 4-2 to Fort Wayne in the Central Division finals last year but has a 2-0 lead in this year's best-of-7 series, which continues at 7:30 p.m. Wednesday at Memorial Coliseum. Lowney, who is in his third professional season out of Ferris State, having spent all that time with the Komets, has worked on improving his game. It's common to see him still on the ice after practice, working on his skills with forward Mason Baptista. “There are some guys who stick around a lot after practice, shooting pucks. I help them out and they help me out with different tips, so it's nice to get a little bit of extra work in after practice,” said Lowney, 25. Assistant coach Ben Boudreau, who was prophetic when he boasted last fall that Lowney was destined for a breakout season, has also worked heavily with Lowney and the other defensemen, Cody Sol, Chase Stewart, Josh Elmes, Kevin Gibson, Craig Cescon, Sean Flanagan and Cam Knight. Captain Jamie Schaafsma has also dropped back from forward to help out. Lowney was Fort Wayne's top scoring defenseman in the regular season with five goals and 38 points, which ranked 15th among ECHL blue-liners. Lowney and forward Anthony Petruzzelli were the only players to appear in all 72 Fort Wayne regular-season games, though Elmes totaled 73 games (59 with Fort Wayne and 14 with Rapid City). 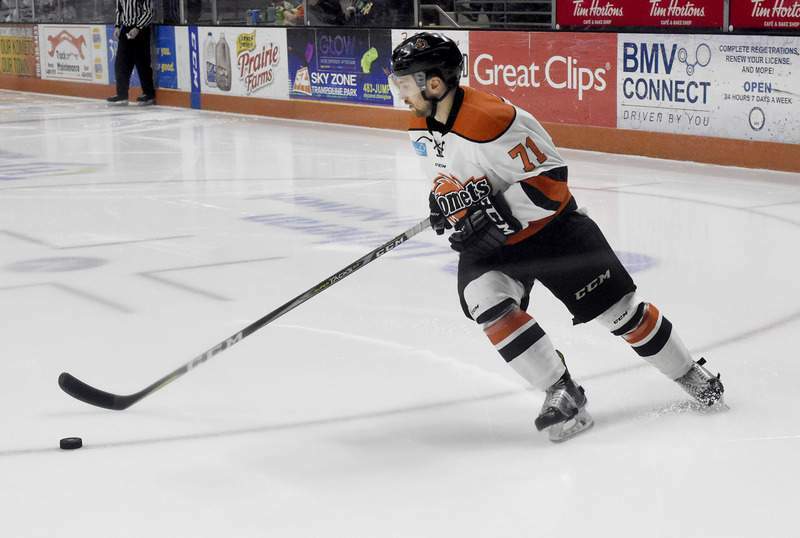 Note: The Komets had hoped to get Phelix Martineau back from the American Hockey League for Game 3, but he's day-to-day with an upper body injury that was suffered in Laval's second-to-last game. He cannot be reassigned to Fort Wayne until he's healthy. He had four assists in 30 games for Laval, 12 goals and 21 points in 23 games for Fort Wayne in the regular season. ... The Indy Fuel parted ways with coach Bernie John.